In Sept. 1927 the New York Times announced the opening of a new hotel in Chelsea: "One of the important improvements in the old Chelsea district this season is the fifteen-story Carteret apartment hotel occupying a large plot at 208 West Twenty-third Street, between Seventh and Eighth Avenues, in the same block as the old Chelsea apartment house, one of the pioneers among the larger buildings of that type." The old Chelsea referred to is the Chelsea Hotel at 222 W. 23rd. The Times went on to say "The Carteret will be ready for occupancy this month. It contains apartments of one, two and three rooms for transient and permanent guests. Fifty per cent. of the suites have been leased to permanent residents. There is a restaurant in the building operated by the hotel." This ad for the new hotel appeared in the Manhattan telephone directory, Winter, 1928. A view up 7th Ave. from 22nd St. in the New York Public Library's Digital Collections shows the back side of the building with a prominent Hotel Carteret sign at the top. A unique feature of the Carteret was that room was provided on the ground floor for the Chelsea Presbyterian Church. In 1946 this arrangement came to an end. The Times (18 Nov. 1946, p. 43) reported "The Chelsea Presbyterian Church, dedicated in 1927 as New York City's 'first skyscraper church,' held its last service yesterday at the Hotel Carteret, 208 West Twenty-third Street." Pastor was the Rev. Dr. Thomas Harvey Whelpley "from the time he laid the cornerstone of the present building nineteen years ago." In 1968 an investment group headed by Nathan Brodsky, Milton Schapiro and Peter Jakobson oversaw the conversion of the Carteret Hotel to an apartment house (Times, 1 March 1968, p. 60). Nathan Brodsky's obituary in the Times (1 Aug. 2006) specifically mentions the Carteret as one of his early projects. 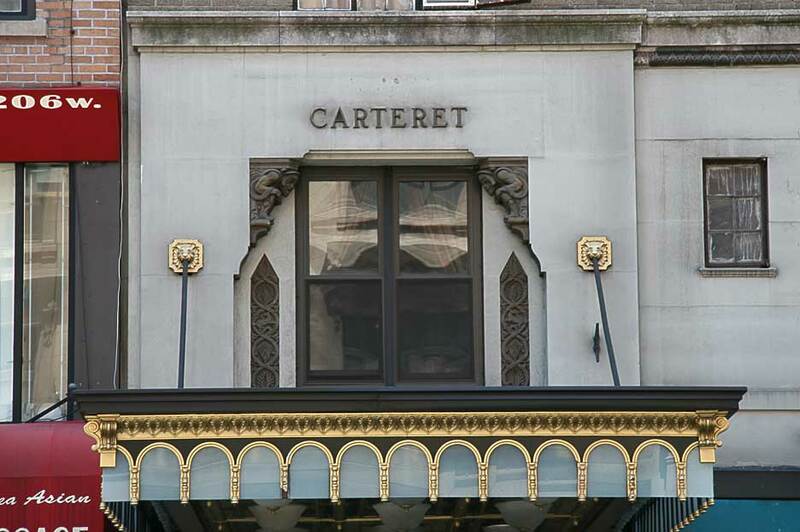 The Carteret was designed by Emery Roth (1871-1948), a prolific architect of New York hotels and apartment houses. In Sept. 2007 the skyscrapers database at Emporis.com listed no less than 87 structures credited to Roth. Some of these include the San Remo, Beresford, and Eldorado on Central Park West, the Belleclaire on Broadway, and the Hotel Dorset on W. 54th St. Henry Roth and fellow archictect, D. Everett Waid, have left their names on a cornerstone at 244 E. 14th St.